New York Magazine and Vulture contributor Mark Harris got a lot of attention for his 2008 book, Pictures at a Revolution: Five Movies and the Birth of the New Hollywood. That book used the films vying for the 1967 Best Picture Oscar — The Graduate, Bonnie and Clyde, Guess Who’s Coming to Dinner?, Dr. Dolittle, and In the Heat of the Night — as a lens into the changing world of Vietnam-era Hollywood filmmaking. Next, Harris turned his attention to an earlier era in which Washington enlisted Hollywood storytellers in the World War II effort, hiring them to make motivational films and documentaries and to record history through artists’ eyes. In his book Five Came Back: A Story of Hollywood and the Second World War, Harris examined the wartime work of five directors — Frank Capra, John Ford, John Huston, George Stevens, and William Wyler — and revealed how the men shaped the war’s messages and vice versa. The result was a detailed chronicle of artistic and social change during a crucial period of American history, as well as a big tapestry-ensemble drama about five talented, complicated men making their way in the world. The book is now a documentary debuting on Netflix March this Friday, with narration by Meryl Streep and interviews with Steven Spielberg, Francis Coppola, Guillermo del Toro, Paul Greengrass, and Lawrence Kasdan. I talked to Mark recently on the Vulture TV Podcast about telling and retelling this epic story in two very different mediums. Listen to the conversation, and read an edited version below. Let’s put a frame around this for people who are not familiar with the subject of Five Came Back. What is the story that you told in your book that is being retold in the documentary series?The story is about five directors who served as documentarians and propagandists during the war. They went around the world filming the war for the American public, and my book is about their experiences in that war, and how it changed them as directors and as men. This is a formidable and very different group of filmmakers. You’ve got John Huston, who’s almost kind of an Ernest Hemingway character. And then there’s Frank Capra, whose last name became an adjective, practically: Mr. Optimistic, corn-fed, “I believe in America,” apple pie, “We can do it.” And then there’s William Wyler, who was more of a journeyman, I guess — I mean, how would you describe him? The interesting thing about Capra and Wyler is that, of the five, they are the two immigrants. Wyler came [to the United States when he was a teenager], Capra came when he was a toddler. But they had really different experiences. Capra’s experience of being an American was to look for opportunities to express this deep, deep patriotism that he felt. A constant assertion that he was not a foreigner, that he was not an outsider. That his American identity was real. For Wyler, who was the only Jewish director of the five, his identity as a European was also very real to him. He was a patriotic American, but he had friends and family trapped in Europe who he was desperately trying to get out as war approached in Europe. And he was less interested in flag-waving than in beating a menace that he understood the danger of in a firsthand way. That’s interesting, because there’s was a point where Wyler was asked to make a documentary about the plight of black soldiers in the South, and he had problems doing that, didn’t he? He did. He accepted the assignment, and then he and the African-American playwright Carlton Moss, who was assigned to write the movie, went on a tour of military bases throughout the South and West, and Wyler was appalled, first of all, at the way Moss was treated — you know, that they couldn’t stay at the same hotels or use the same bathrooms. And second, the more he looked at it, he was appalled by the way black soldiers were treated by the Army itself. What about George Stevens and John Ford? Ford was the oldest of the five directors. He already had teenage children; he was in his late 40s by the time he went into the war, and he was also the only one of the five who technically had been old enough to go into the First World War, which he did not do. He was just starting out in Hollywood and he elected to stay [home], and I think that always haunted him to a degree. He felt that war would be an opportunity for him to test his personal courage, and in many ways, that is what the Second World War was for him. A test of his own courage and an education for him in the courage of others. He also really loved the sea. He was the only one of the five men who joined the Navy rather than the Army. He’s also the only one who joined up before Pearl Harbor. He really saw the threat coming quickly. George Stevens — you refer to Capra as corn-fed, all-American. Stevens actually was that. He was a native Californian, and he’d lived a really happy-go-lucky life as a kid. Came up in Hollywood making really lighthearted movies: Fred Astaire and Ginger Rogers, Laurel and Hardy shorts, Katherine Hepburn comedies. Unlike Ford, Stevens was not persuaded early on that the war was even something America needed to be involved in. By his account, he came to an understanding late, and interestingly, went deeper into the war and saw more horror and suffering in the war than [the rest] of the five did. The way you were talking about Ford as seeing the war as an opportunity to test his mettle: John Huston had a touch of that too, didn’t he? He always had that kind of he-man thing; he went to Africa to hunt elephants. Huston was a swaggerer. In Hollywood, he was seen as a rich kid. He was the son of Hollywood royalty. He would drink too much, he would get into trouble, he was seen as reckless. He actually got into a couple of car accidents and camped out in Europe for a while to reboot his life. He came back to Hollywood before the war and started to make his name under Wyler’s tutelage as a screenwriter, first, and then with Maltese Falcon as a breakthrough director. Even more than testing his courage, Huston thought the war was going to be one big adventure. Of the five, he was probably the one who most thought it was going to be fun, and one thing that really interested me in telling these stories is each of the five went into the war for a different reason. Then the war surprised each of the five in a different way by not being quite like what he thought it was going to be. WWII has just about passed out of living memory now. There are a few people left who experienced it firsthand. Almost 20 years ago, Steven Spielberg, who’s in the documentary Five Came Back, directed Saving Private Ryan. Then later, he and Tom Hanks would do their two mini-series for HBO, Band of Brothers and The Pacific. Some of the urgency on Spielberg’s part was because these World War II veterans were not getting any younger, and a lot of them had already started to die off, and he wanted to make this grand, definitive statement about what the war meant while there were still people around who had gone through it. How did you feel about revisiting this period of history today? My father, who died when I was young, went into the war when he was 17, and he would be 92 now if he were alive. So that generation really is largely either gone or very, very old. And as remote as World War II was to me, as a sheltered, happy kid growing up in the ’70s, it is generations more remote to people who were toddlers when Saving Private Ryan came out. So I’m very conscious that we’re telling a story in this. There’s a story of history, but it’s also a story of film history where we’re trying to stretch a narrative line over 75 years. One reason I was really happy that Steven Spielberg and four other directors serve as our on-camera guides in the documentary is that you get a sense of film history as one long, flowing river. I mean, Steven Spielberg got to meet William Wyler. Wyler’s career was ending just as Spielberg’s was beginning. I like the feeling that there’s some historical continuity there. I’m going to turn into Oprah here for a second and ask you, what did you learn about yourself in the years that you have spent living in this other world, this other decade? How has it changed the way you see things? How has it changed you? Oh, Matt — I thought when you said you were gonna turn into Oprah, you were gonna give me a car! [Laughs.] Uh … that’s a good question. Nobody’s asked me that. I went into this at the beginning from a place of aversion because the idea of running away from your happy, safe family life at 17 and going to put yourself in harm’s way and maybe get killed over an ocean felt unimaginably alien and strange to me. That was as a kid. And now, on a personal level, I’m fascinated by the fact that, like so many World War II veterans, these men really felt that this experience defined them. It shaped who they were. I don’t long to have been tested in war, I feel very fortunate that I have not been. But it has made me think a lot about what kind of experiences define who you are. 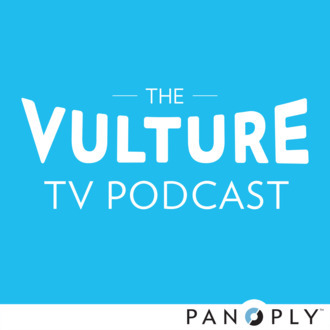 Tune in to the Vulture TV Podcast, produced by the Slate Group’s Panoply, every Tuesday, on iTunes, or wherever you get your podcasts. And please send us your burning TV questions! Tweet us @Vulture or email tvquestions@vulture.com.